I was asked yesterday why I am so happy all the time, and I responded that it was because of yoga and practicing mindfulness. Then, I realized that’s not entirely true: I also watch Ellen. So, when I heard that my friend Darrell has not seen the Ellen Degeneris / Matt Lauer prank war, I decided to compile these clips from Ellen’s show, in sequential order. When too many days go by without a trip to Swan River Yoga, it feels like ‘something is not right.’ A few months ago, during class, a yoga instructor said to “turn the corners of the mouth up.” At the time, it was difficult for me to recognize which direction was up, so I made some strained expression on my face before I realized the “yoga pose” was to smile. I really enjoyed the thought of smiling being a physical movement of muscles, rather than an uncontrollable response to something that made you happy. Ever since then, I have tried to incorporate this new yoga pose into every practice. In some poses, it is actually quite difficult. In others, it helps redirect the focus. But, it always enhances the experience of my yoga practice. When I returned from a two-week trip, I practiced lifting the corners of my mouth during a yoga class with a new instructor. At the end of class, she told me that she enjoyed watching me practice, as I was smiling so much … even in the hard poses. That day, I probably had even more smiles than usual though, as I have been overwhelmed with love and support after letting everyone know that I will be starting a faculty position in Montana. There is one person that has perfected this yoga move: my college roommate, Kathy. She smiles. Always smiles. It took four years of living in the same room with her to differentiate her happy smile from her normal smile from her angry smile. It’s all in the eyes. The mouth remains constant. My sister, who was about 8 when she first met Kathy, asked me “does she smile in her sleep?” And, I can tell you that, yes, she smiles in her sleep. But, she also dreams about swords and you don’t want to mess with her when she is dreaming about swords (as I did by accident one night … ). Smiling is an act of happiness, but it also creates happiness. So, don’t forget to smile! 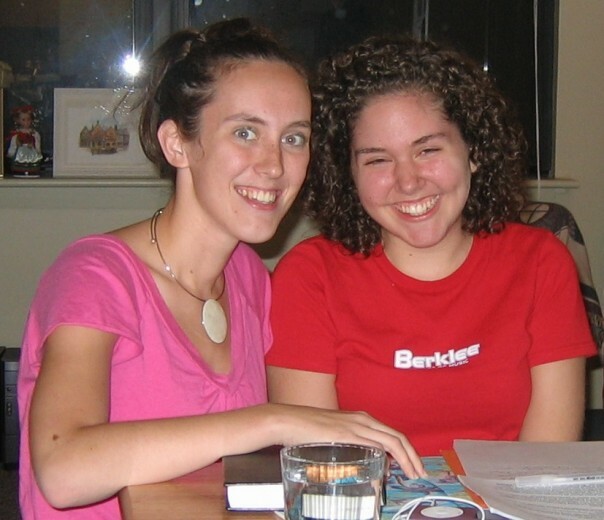 A throwback to our junior year of college. Even when she is wearing a mask, you can see that she is smiling. Finally, I can announce to everyone: I will be starting a tenure-track faculty position in the CS department at Montana State University this Fall. Really, it is a relief to have this decision over with. I arrived the night before my interview, and had to prepare my “teaching demo” between arriving at the hotel and going to bed. (well, I started on the plane …) Dave joined me in Bozeman, MT for the interview day. During my talk, he sat in the second row. It was really a happy feeling for him to be there with me. There are several times in life where the practice of mindfulness is most apparent, and job interviews is one of them. I kept thinking to myself “this is my job interview, stay in the moment!” This was my first interview, and I wasn’t sure if, or how many, more interviews would be extended to me. The members of the department were incredibly nice and went above and beyond making us welcome in Bozeman. It just felt right, and so I am looking forward to joining this department in just a few months. The hardest part about deciding to move to Bozeman, MT is that it is rather far away from Philly, NYC, and NOLA. Not all interviews went as smoothly as the interview at MSU. As expected, some CS folks have told me “why are you applying to CS departments, you are really a mathematician” and some Math folks told me “why are you applying to math departments, you are in computer science.” When this question was asked, I always thought to myself, “will they be able to fairly evaluate me when I am evaluated for promotion and tenure?” Probably not. One interview, though, takes the cake. The chair of the department said to me “you don’t have any children, so that won’t be a problem” and made comments about how I must come from a poor background since I qualified for the GAANN fellowship. Another faculty member at that same university tried to intimidate me, saying that it is very strange that I have had any postdoc in CS, yet alone, two post-docs spanning three years. The feeling I got there was a rather un-welcoming feeling. So, starting this fall, I will be an assistant professor! Now, I just need some graduate students and some big grants … feel free to send both students and money my way. 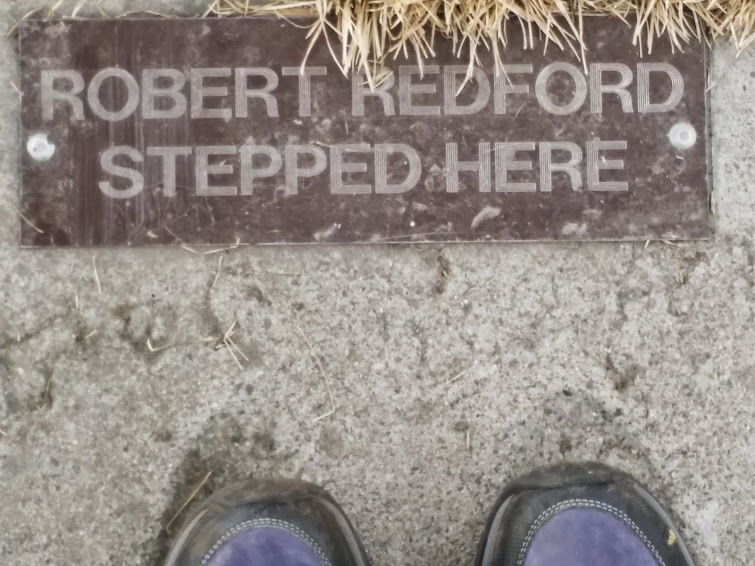 One of the sights in Bozeman: stepping in Robert Redford’s shoeprints.